Grammy nominated Musician. Author. Educator. Interpreter. That’s a lot of different hats for one person to wear, yet Yvette is making it work. YVETTE LANDRY grew up in Breaux Bridge, Louisiana, not far from the levees of the Atchafalaya Basin, North America’s largest swampland. It was in and around that swamp where she learned an appreciation for the music, dance, stories and language of her Cajun culture. After earning a master’s degree in education and developing a successful teaching career, she began telling stories through song. 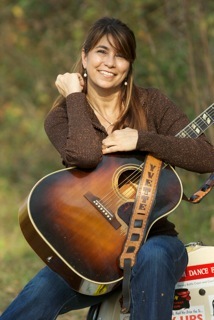 Playing a variety of instruments in several Cajun bands, Landry also fronts her own band, The Yvette Landry Band. Her debut award-winning album titled “Should Have Known” was released in 2010. (The album was named Offbeat Magazine’s “Best Country/Folk Album” and Landry “Best Country/Folk Artist”). Over the past several years, Landry has traveled the world and played countless cultural festivals and venues – from the New Orleans Jazz and Heritage Festival to the Bluebird Café in Nashville. She toured Russia and served as a Cultural Ambassador on behalf of the Library of Congress to perform at the Festival of Traditional American Music and graced the stage at both the Library of Congress and John F. Kennedy Center of Performing Arts in Washington, DC. By day, Landry is an educator, teaching American Sign Language and Song Writing at the University of Louisiana at Lafayette. She is also a private homeschool teacher and has also taught bass, guitar, accordion and vocals at notable camps including Festival of American Fiddle Tunes, Voice Works @ Centrum, Ashoken Fiddle and Dance Camp, Cajun/Creole Week @ Augusta Heritage Center and Louisiana Folk Roots Camp. By night, Yvette Landry is a musician/singer/songwriter who continues to tour worldwide as a multi-instrumentalist, gracing the stage with greats such as Vince Gill & The Time Jumpers, Darrell Scott, Rhonda Vincent, and many more. The State of Louisiana 2013 and 2019 Music Ambassador, elected as Governor to the Memphis Chapter of the Recording Academy, Board Member of Louisiana Folk Roots and former Director of their summer Cajun & Creole Music Kids Camp, Landry strives to bring cultures and traditions together, ensuring that they will be passed along. Since her debut album in 2010, Landry has released three more CDs…First was “No Man’s Land” with a host of friends including Bill Kirchen, Cindy Cashdollar, Dirk Powell lending a helping hand. Later she released, “Me & T-Coe’s Country” and “Oh What A Silent Night” with pedal steel ace, Richard Comeaux. Her first children’s book, “The Ghost Tree,” was nominated for “Louisiana’s Young Reader’s Choice Award.” And more recently, her new book, “Madame Grand Doigt,” along with “The Ghost Tree,” were formally accepted into the Library of Congress Collection for Children’s Literature. Recorded at famed Dockside Studios, and nominated for Offbeat Magazine’s Best of the Beat Awards in two categories (Best Roots Rock Artist and Best Roots Rock Album) Louisiana Lovin’ will take you back to a time where dance halls and Juke Joints in Louisiana were the place to be.